Need a fun wedding gift? 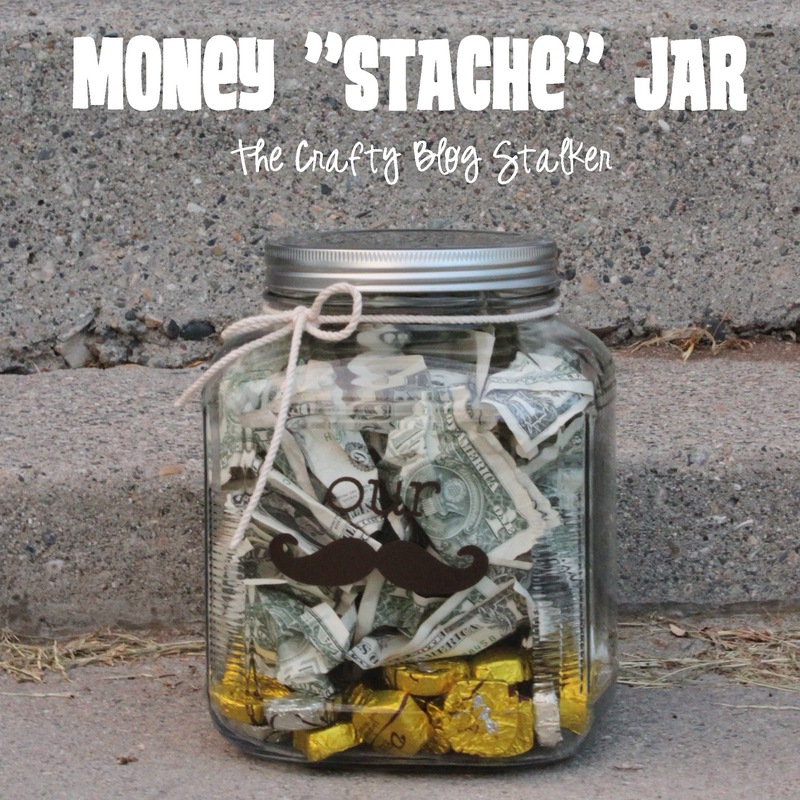 How about a Money Stache Jar. Can be used as a money jar, cookie jar, or candy jar. Fun idea! Last weekend my niece got married. And there was no way The Crafty Blog Stalker was just going to give a couple of towels. I wasn’t exactly sure what I was going to do until I found these cute glass jars. It was a perfect size for a cookie/treat jar. Now the jar is cute by itself but I can’t leave cute enough alone. I applied the vinyl to the jar. Then came the fun part of filling the jar. 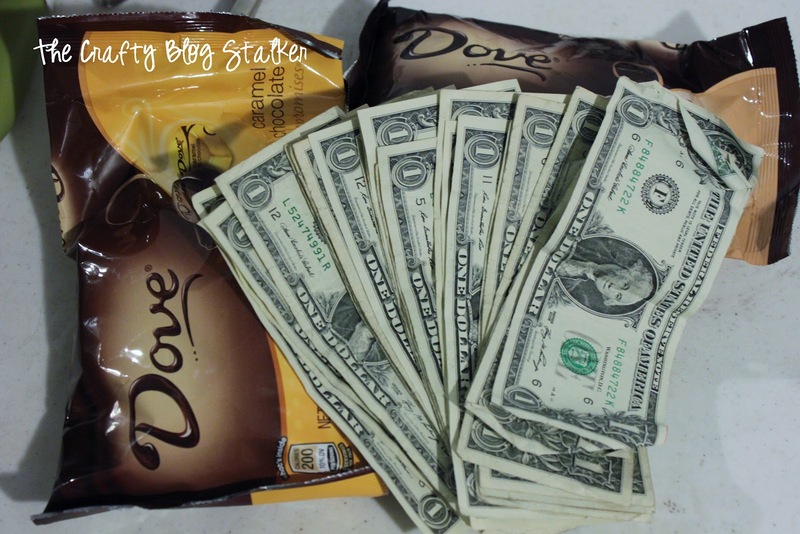 We got a couple of bags of chocolate and then 40 singles to fill the rest of the jar. My original thought was to roll all of the singles up with ribbon by my husband said there was no way that would fill the jar, and after experimenting with a few I realized that he was right. Man I hate when that happens! So we just crinkled up the bills instead and put them in. 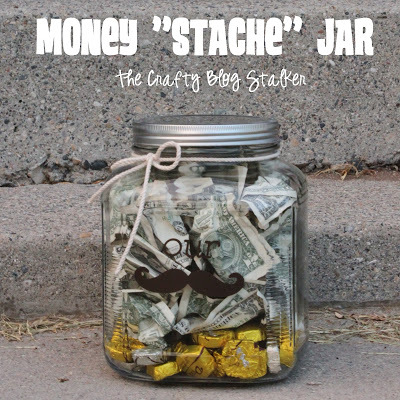 Here is a close up of the “Our Stache” in vinyl on the jar. Tied with some rope around the top. What newlywed wouldn’t love a jar of cash? I am not a newlywed and I know I would like one! 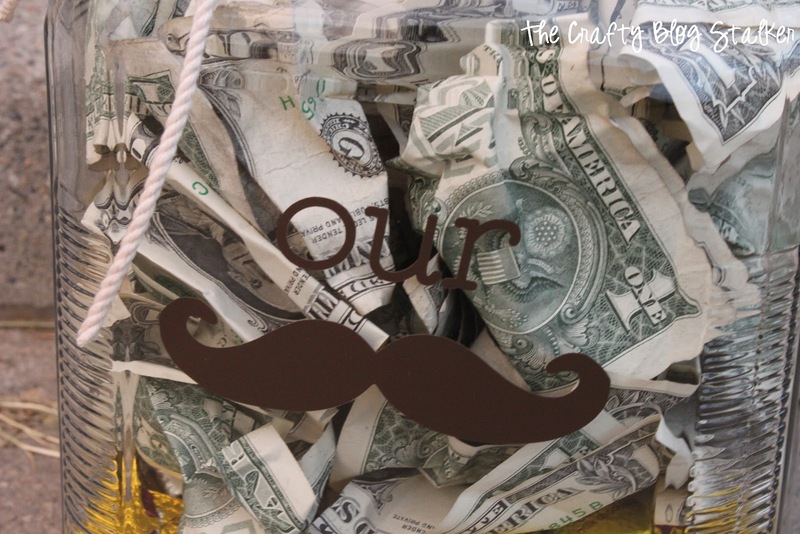 Very cute idea and you’re right, who wouldn’t want a ‘stache of money and chocolate?! What a cute idea. 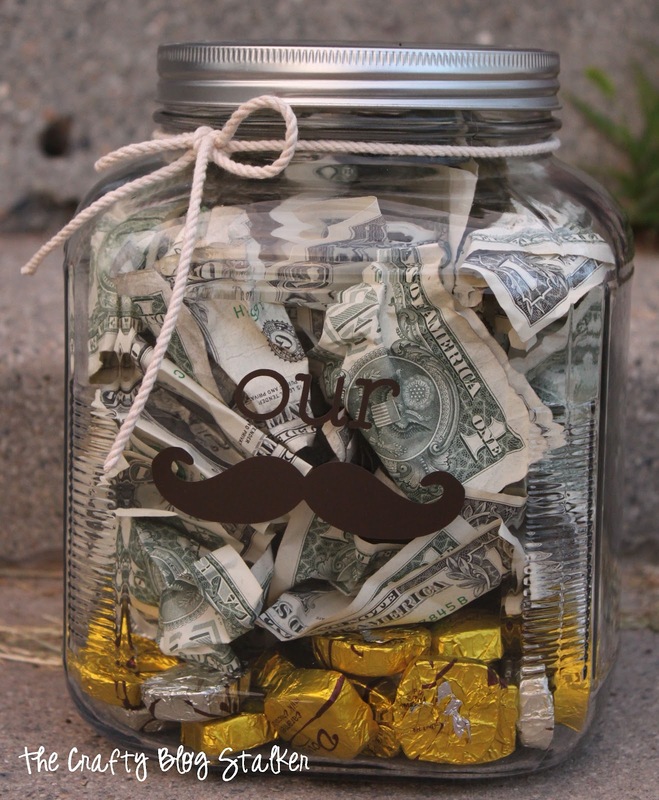 I would have loved to get a jar like this when D and I got married (plus the cash is nice too). Thanks so much for sharing on Tout It Tuesday. Hope to see you next week. That’s a great wedding gift idea and SO much better than towels! I love this take on the stache idea! It’s so awesome! I saw you on 733 and I’m so glad that I stopped by! You’ve got a new follower in me! So simple and so cute! Definitely going to do this! ha ha ha – this is so clever and so cute. I just adore this idea. THanks for sharing at our party this week. Gosh. i am going to use this next weekend for a wedding reception. Thanks – I was looking for a way to present money! When I got married, the best man and his wife gave us a red plastic barrel containing 50 silver dollars! I still have the barrel and some of the silver dollars! Hoever, I’m no longer married and the best man died of cancer a few years ago. His window and I have continued our friendship through over 50 years of thick and thin! How creative and thoughtful! I’m going to keep this in mind for the next wedding gift I need. Thanks for sharing at Terrific Tuesdays. This is super cute. I like how you put “our” instead of my. Very fitting for a wedding gift. Adorable! You did a fabulous job and I wanted to let you know that I am featuring this today! Stop by and check it out! I need one of these though ours will be a “Vacation Stache.” Thanks for sharing on Tout It Tuesday. Hope to see you again for tomorrow’s party. What a super cute idea! I’m totally pinning this to do later! Thanks for the inspiration!!! This makes me laugh, I absolutely love it! What a great idea!!! You should come share this idea on a party I cohost every Saturday! DIY Showcase! It’s open now! what size is the jar? 32oz or 1 ga? Thank you for catching that, I did use the Gallon jar. Of course, the vinyl could be applied to the smaller 32 oz jar as well for a smaller “stache” jar. Thanks Beate!